A day to enjoy wonderful food with those you love. With three kids we don’t often go out on Valentine’s Day proper often opting for a date night around the day instead. Last year Kevin cooked our celebratory meal so I was on deck to come up with a meal that would be ideal for a night where my daughter is scheduled to have dance until 5:30. While reading my morning paper I saw an ad for a local fish shop which stated the had red and white heart shaped cheese ravioli on sale for Valentine’s Day and I decided I would get that to be the central point of my dinner for my family. A quick Google search for “Pasta Sauce for Cheese Ravioli” returned this result from The Chew television show. It looked simple and quick. Ideal for a busy week night. 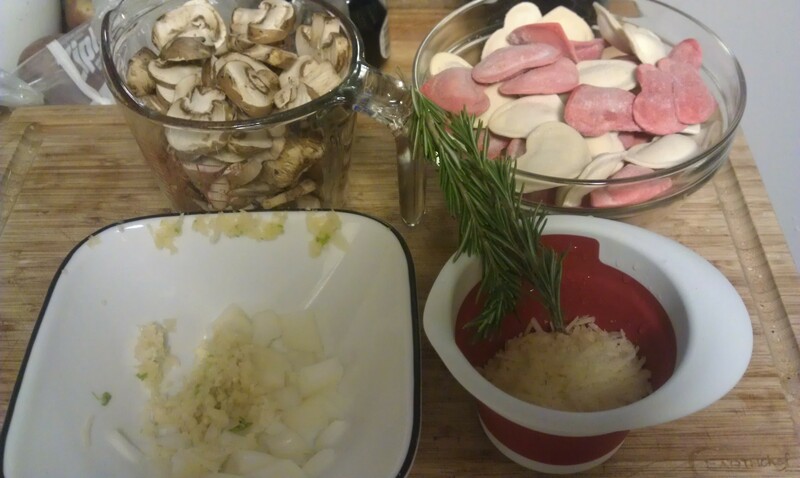 My ingredients starting from top left: 2 cups chopped cremini mushrooms, red and white heart shaped cheese ravioli, parmesan cheese, two sprigs of rosemary, and chopped onions and garlic. I had to make a couple of substitutions for ingredients. I wasn’t able to find shallots so I went with about some chopped sweet onion and added an extra clove of garlic on Kevin’s suggestion. I also followed the cooking instructions on the packages of pasta as they were frozen raviolis. Also the heart raviolis were a bit smaller than a square ravioli so I went with 2lbs over just a 1 1/2 lbs recommended in the recipe. 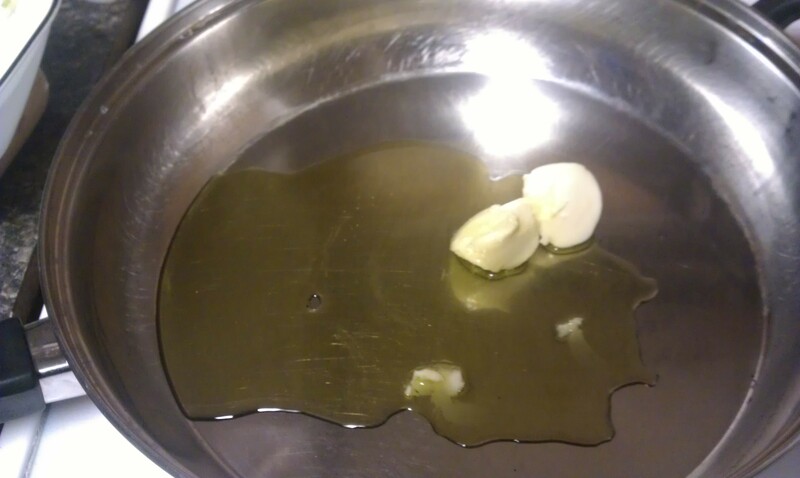 Butter and olive oil together in the pan. Here are my two tablespoons of butter and olive oil in the frying pan heating up. This is the first time I’ve ever put this combination of oils together so I wasn’t sure what to expect as it heated up. 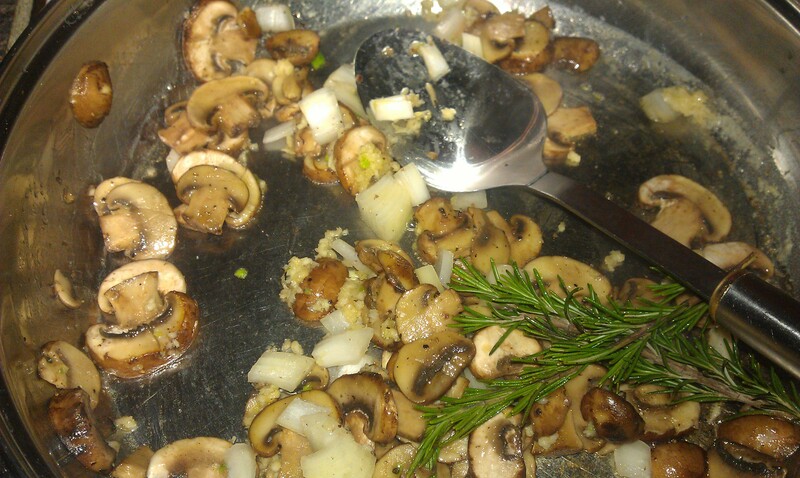 Once the oils are hot I added the mushrooms and rosemary. The first thing I noticed is that the rosemary became really fragrant as it warmed up in the oils. The mushrooms browned very smoothly and I went twice around the pan with my pepper grinder for the black pepper and gave a health dash of salt. At this point I was struck by how the green of the rosemary became as the sauce comes together. The components also gave off a really great smell. My kids mentioned more than once that it smelled really good. 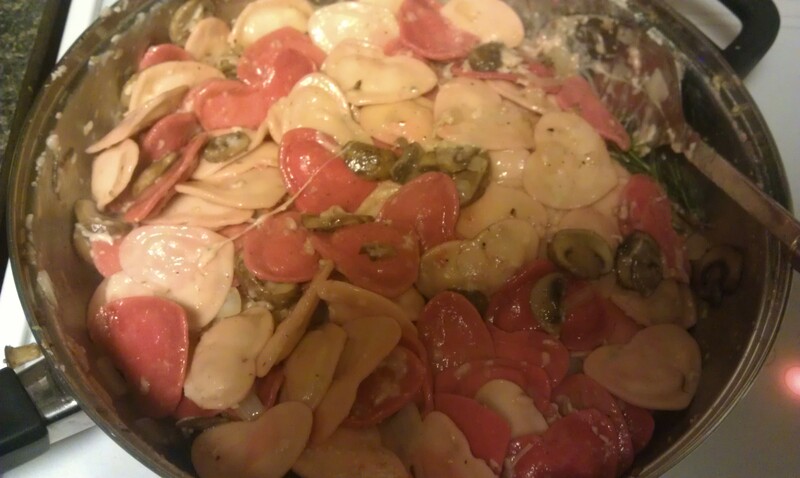 Red and White Heart shaped pasta, cooked and drained. I found this pasta really easy to cook. 10 minutes at at soft boil and the ravioli was perfectly cooked and ready to be put into the pan with the sauce components. I was supposed to reserve some of the pasta water to use in the sauce. 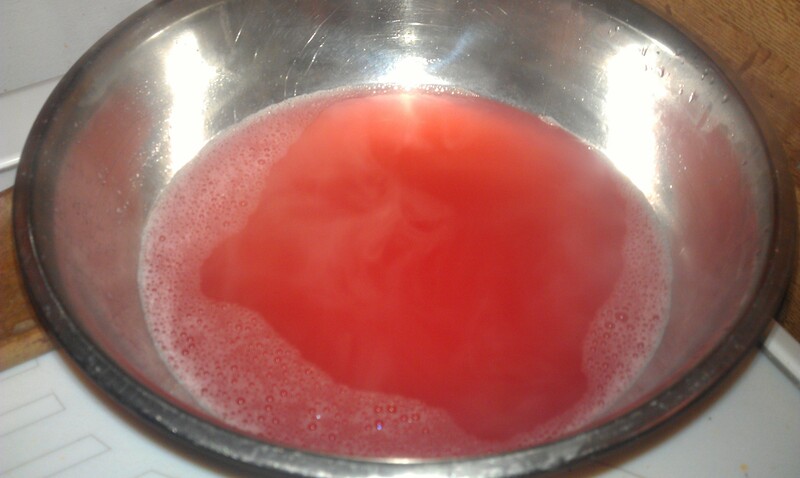 The red raviolis managed to leave some colour in the water but it didn’t affect the sauce in terms of flavour or colour. The final step of adding the two remaining tablespoons of butter with the pasta water and the parmesan with the raviolis to the pan went in short order and it didn’t take long for the whole thing to come together nicely. My family enjoyed every bite with even my 3 year old eating his portion in under 10 minutes. 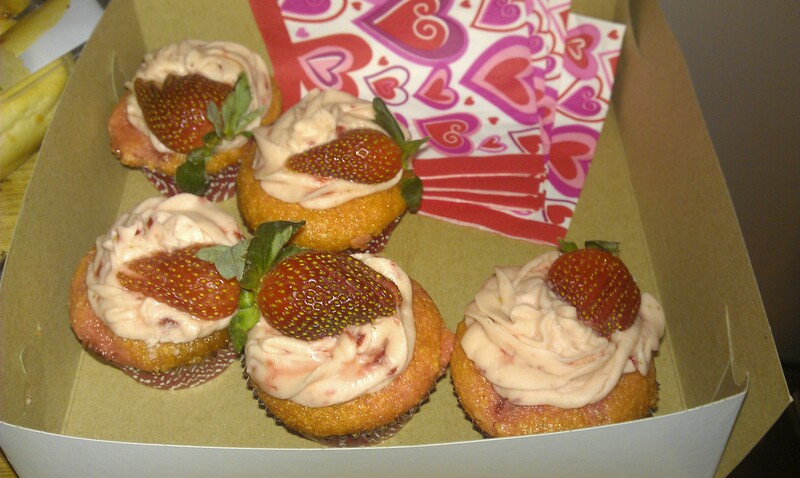 Of course what is Valentine’s Day without something sweet to end the day. Kevin is a bigger fan of strawberries instead of chocolate and when I saw this at the Fried Green Tomatoes Facebook page I knew I had to get some for my family to complete our dinner. They were delicious and again even the non sweet eating 3 year old enjoyed every bite. The 3 year old tends to ask for desserts and never finishes them. This was not the case here. All in all a great simple dinner paired with a great dessert. Heat a large pot of boiling water over high heat and season generously with sale (make it taste like the ocean). Heat a saute pan over medium-high heat. Add 2 tablespoons of butter and the olive oil. 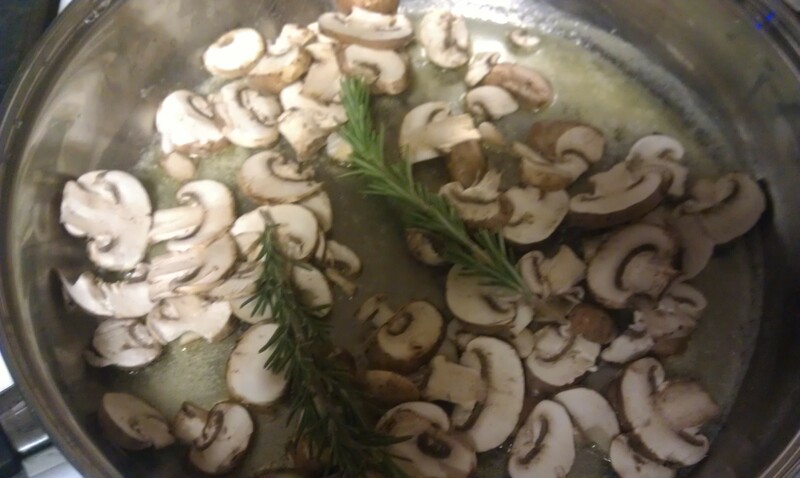 Once hot, add rosemary sprigs and mushrooms. Toss the mushrooms and season with salt and pepper. Meanwhile drop the ravioli in the boiling water and stir with a wooden spoon. Then add the garlic and shallot to the pan and toss to coat. Cook 2 – 3 minutes, or until the garlic and shallots are cooked through (I didn’t have a shallot so I substituted some chopped sweet onion and an extra clove of garlic). Cook the ravioli one minute shorter than the packaged instructions (I followed the package instructions as I used a frozen ravioli). 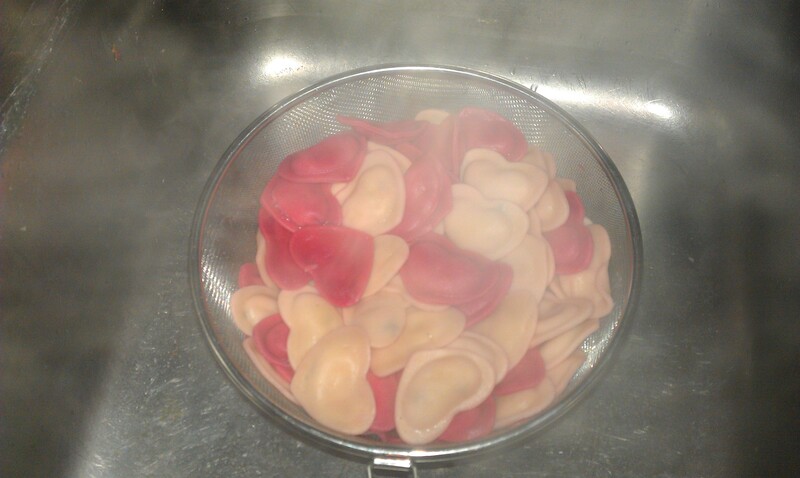 Drain ravioli, reserving the pasta water, and put into the saute pan. Add about 1/3 cup of the pasta water along with the remaining 2 tablespoons of butter. Add Parmigiano and toss the pasta until the sauce is creamy and emulsified. Serve immediately. Posted on February 14, 2013 by Shirley Robert	• This entry was posted in Cooking with Kids, Recipes and tagged cheese ravioli, clove of garlic, cremini, dinner, food, Fried Green Tomatoes, garlic, google search, mushrooms, onions, ravioli, rosemary, The Chew, Valentine's Day, vegetarian. Bookmark the permalink.